Last edited by Snowman on Mar 19 2016, 12:18pm, edited 1 time in total. Theoretically, a few. Realistically, none. I can't believe hte has been out for two years and I'm still the same size I was when it came out. FIRST: Use item Seal of the damned on unholy rift to 0. 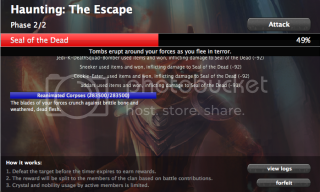 SECOND: Attack/Assassinate Souls of the Damned to 0. Phase 1/2 completion: The unholy portals closes. Cries of agony resound as the damned are returned to rest. EB Complete! Your forces make it across the bridge with naught a moment to spare. 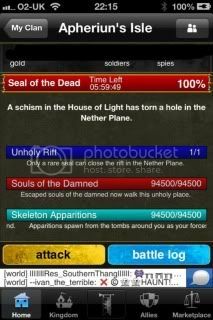 Q: What is Seal of the Damned? A: A special item which allows you to get past the first stage of Haunting: The escape. A: Pay 59 nobs or you can get it as a drop from various epic battles. NOTE: The devs mentioned that the drop rate and the epic battle from which they the seal drops can change. Q: I have been doing the EBs above all day and haven't got one! Why? A: it has been classed as a rare drop so you probably won't get it first time. The EBs which you can get it from as well as the drop rates will change over time. A: You can find your seal in the Profile section, and it can be bought from the defence section of the marketplace. Q: Wait... Did you just say this was a defence item? Won't i lose it if I get attacked? A: Yes the seal is a defence item but you will not lose it if you are attacked. Don't Worry! Q: I have checked my profile and still cannot find my seal! A: The seals were only handed out for free on one particular day. If you were inactive during the free handouts you will not get a seal. If you are sure you were active and still don't have one, email support@athinkingape.com or use feedback. Q: How does the seal work? A: You need only 1 person with the seal to complete the EB for the whole clan. It is used once to get past a 1 hp enemy. Q: What is the Haunting: The escape? A: It is a variation of the regular haunting that yields 3x gold. How much money did the developers make from HTE in two years? Lol this is still here? Snoopy wrote: Lol this is still here? Lets say a seal is dropped (hte open) every 1 mins on kaw. How many minutes in 2 years? 1051200 minutes. How much does a SOD cost? 59 nobility points. Devs made about $614,005.920 (USD) on SOD's in 2 years. This does not count xtals and other nobility purchases and propacks and whatever. This is a extremely rough estimate and i am very bad at math and even worst whilst intoxicated. I'm just saying, so everything i said here might be completely wrong. Last edited by AshtonRocks on Mar 20 2016, 10:41am, edited 1 time in total.